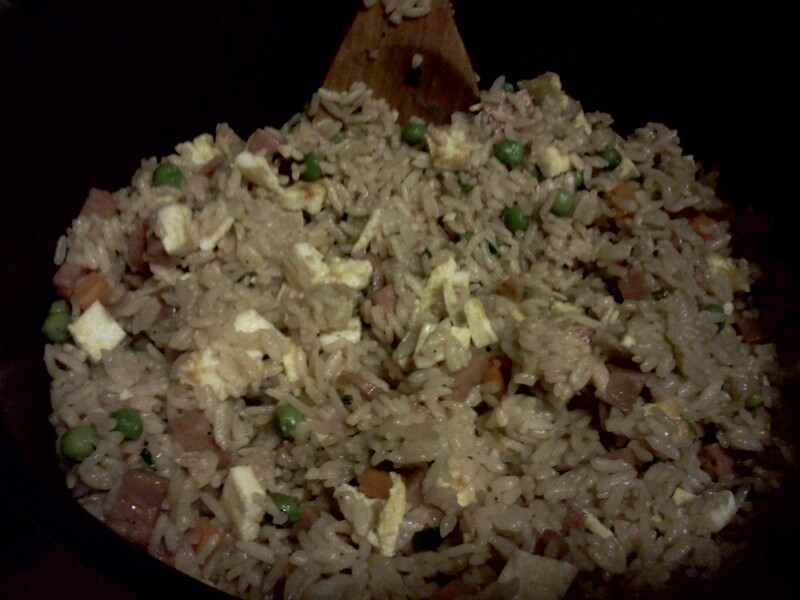 I love making fried rice, and my family seems to love how I make it, so I finally decided to write down the recipe. First of all, fried rice is traditionally made with day-old rice. Ideally, you’d want to make the rice a day in advance and let it set and dry out a bit. If you can’t make the rice the day before, try to make it as early as possible, and leave it out on a counter to dry out until you’re ready. Rinse the rice with water until it’s clear. Cook the rice using the chicken stock instead of water. I use a rice cooker, so I don’t know the exact proportions using a normal pot. Normally you want the water/stock about half an inch above the surface of the rice. After the rice is done, scoop it into a large bowl and let it air out and dry for a couple minutes. Add the soy sauce and sesame seed oil, folding the rice slowly until it’s a uniform brown. Set the rice aside and let it rest. Mix the frozen peas and carrots along with the garlic, ginger, yellow onion and green onion into a microwave safe bowl. Fill the bowl with water, cover, and microwave for 2 minutes. In a large pot add the cooking oil and bring to medium heat. Add in the chopped Spam and pepper; stir occasionally until the Spam is lightly browned. Add in the strained vegetables from before; stir occasionally (so nothing sticks to the pot) until the vegetables soften and cook through (3-5 minutes). Prepare a a small, non-stick, frying pan with butter/oil/cooking spray, bring to medium heat. Pour out half of the beat eggs to form an egg pancake. When the bottom begins to brown, flip. Move the finished egg to a cutting board. Repeats steps 1-4 with the remaining egg. Stack the egg pancakes and cut into little 1/2 inch squares. Add the rice into the pot with your meat and vegetables. Go slowly, one scoop at a time, and try to distribute everything evenly (easier with older rice). Add in your egg pieces a handful at a time, pushing the rice around to help distribute the pieces without breaking them down any smaller. Keep the rice on low heat until it’s warm, stirring occasionally so that it doesn’t stick to the bottom of the pot. Of course you’re welcome to substitute other meats and vegetables as you see fit. Otherwise, I hope you enjoy it! Attention: Weight Tracker ODS has since been updated, be sure to get the latest version here. I’ve released version 2.2.3 of Weight Tracker ODS, my open source weight loss spreadsheet for LibreOffice and OpenOffice.org. Visit my page The Hacker’s Diet with LibreOffice / OpenOffice.org for more information. Cleaned up some of the UI on the main sheet.